Have you ever imagined over twenty marching bands playing at the same time within blocks of each other? A low-level cacophony of crazy? A tonal tango of tuba? HONK! 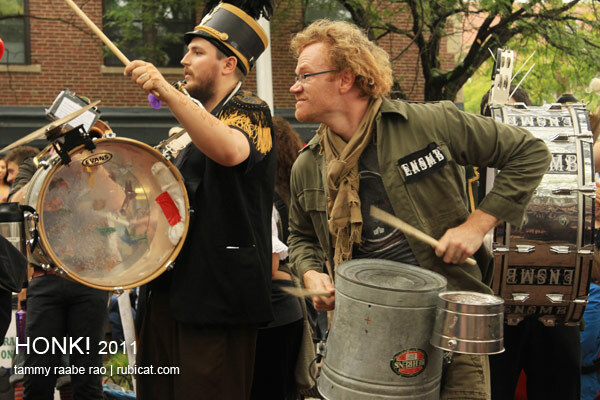 is a festival featuring activist street bands, all with marching-band elements tossed with creative, crazy, colourful characters. Bands from all over the world descend on Davis Square, and play for two days in venues throughout the center. I had never attended HONK! before, and I’m instantly smitten with the spirit of the festival. Of course, driving and working in Davis Square must be madness for those not attending the festival, but consider Kenmore Square during a Red Sox game. With a lot more colour and symphonic noise. What’s not to love? I was part of the color guard in my high school marching band. I enjoyed the parades, the cadences, and the general fun involved with performing. Watching the synchronized aspect of your typical marching band give way to improvisation, comedic renditions of show tunes (often involving kazoo), and a musical anarchy of sorts is entertaining, at the very least. Feeling the energy in the crowd makes the experience all the more personal. It’s currently 5:15ish on Saturday, 1 October. I just drank in the visual and aural spectacle of four bands, and will venture outside for more. Bands perform in Davis Square through 9 PM tonight, and tomorrow’s parade will take the bands from Davis to Harvard Square, where they will join Octoberfest. Finally, the bands will perform on a HONK! festival closing harbour cruise.